The University of Denver Frank H. Ricketson Jr. Law Building consists of 181,000 square feet spanning four stories. 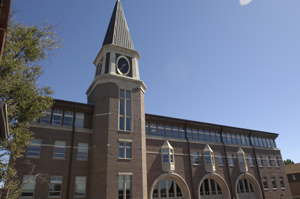 The $63 million structure was built with DU’s signature blend of red brick limestone trim and copper, and was outfitted with the latest in class-and-courtroom technology, including building-wide wireless access, “hot seats” in every classroom, a fully equipped training/mock trial courtroom and in-class digital document cameras, which provide the ability to display crisp images of materials that are not in digital format. The building occupies a pre-developed site. During construction, stringent controls were implemented to prevent water runoff from polluting groundwater that flows into the South Platte River. To conserve water, the University uses underground water to irrigate the building’s landscape, to reduce reliance on city systems. Waterless urinals and sensor-activated faucets and toilets also conserve water. According to University Architect Mark Rodgers, “Low-e” window glass installed throughout the building and the use of heavy masonry reduces heating and cooling costs. Other features, such as occupancy sensors that tell indoor lighting systems when to turn on and off, and library light fixtures that dim when ample natural light comes through the windows, save up to 40 percent on energy costs. Additionally, all of the building’s outdoor fixtures are designed to minimize light pollution in the night sky. To preserve indoor air quality, the architects specified low-gas-emitting paint and carpeting, and allowed the chemicals to “off-gas,” or lose intensity, before occupants moved in. Prof. George “Rock” Pring, who teaches in the University’s nationally ranked environmental and natural resources law program, collaborated with other law faculty and staff, architects, engineers and contractors to keep the building on the green-certification track. He says that building green increases costs only about 1 percent on the front end, and those costs are recouped through savings on energy and other operating costs. “Not only was building ‘green’ the right thing to do, but we hope we set a precedent among universities and colleges across the country that there is absolutely no excuse not to build ‘certified green’ from now on,” Pring says. The University of Denver is applying lessons learned from the Ricketson Law Building to other new campus buildings as it expands its commitment to sustainable construction. For example, the design of a planned new residence hall features geothermal heating and cooling. Water would be circulated through an underground “geothermal field” at a depth where temperatures are constant. A heat exchanger would provide heating and cooling, reducing dependence on natural gas.